The Rotating Pedestal Grill is a great addition to RV parks, campgrounds, beaches or any other outdoor recreational facilities. 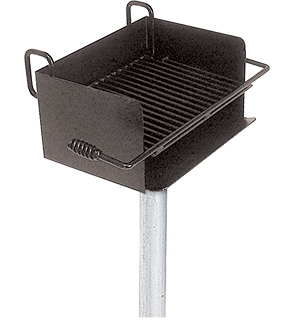 Engineered for safety and lasting performance, this park grill is fabricated with 7-gauge steel base plate and 10-gauge steel side plates. Developed with a 300 square inch grilling surface, the cantilever styled grate is constructed with 1/2" steel bars, supplemented with 5/8" support bars that feature cool coil spring grip handles. These thick grips aid in safely rotating grill and adjusting the grate for more convenient cooking, fire building and clean out. To safeguard users and surrounding spaces, the sturdy pedestal post are configured specifically for in-ground or surface mount installations. The ultra-durable Rotating Grill is available in a non-toxic black enamel finish.